There are plenty of wireless speakers out there, but few are as versatile as the new Libratone Loop. It connects wirelessly to virtually any device via Apple’s(s aapl) AirPlay, DLNA, or Libratone’s own PlayDirect. And it can be mounted on a wall or balanced on a kickstand and placed anywhere throughout your home. At $499.99 it’s a little pricey, but that’s actually not bad for an AirPlay speaker – especially one that’s covered in Italian cashmere wool. The Loop works wirelessly via Apple’s AirPlay, which allows it to connect with any Mac or iOS device that supports the technology. And while AirPlay streams audio over your Wi-Fi network, the Loop also supports PlayDirect, which lets you connect your iOS device directly to the speaker itself. Finally, DLNA support means it should work with many Android devices, PCs and televisions as well. On the audio front, the Loop features digital signal processing (DSP) and digital amplification, along with two ribbon-based tweeters and 120 watts of power. 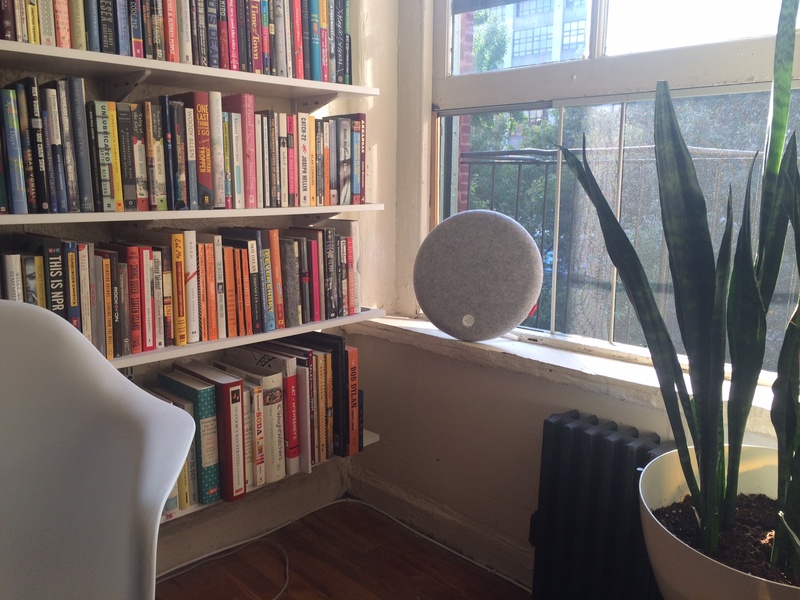 Libratone claims the round shape of the speaker creates a fuller sound by bouncing audio off of the walls and dispersing it throughout the room. I got a chance to listen to it in GigaOM’s New York offices, and while I didn’t quite have enough time to take in the whole “FullRoom” experience, the speaker was certainly loud and clear enough for the rest of the office to hear as well — even though we were testing it behind closed doors. The speaker delivered a very clear midrange with resonant bass response, and did not distort at maximum volume. Part of that is due to the DSP, which won’t please audiophiles but kept music sounding clear no matter the genre and volume. Libratone’s speakers are just as focused on design as they are on sound. The Loop’s design is pure Danish modern, which makes it a perfect fit for any Mad Men-meets-the-future interior design scheme. And though it isn’t designed to be portable like the battery-powered Libratone Zipp, the speaker is small and light enough fit pretty much anywhere in the house. The Loop will be available directly from Apple and a handful of other retailers starting October 15 for $499.99. The speaker comes with both a white kickstand and a bracket for wall mounting. It is covered in removable Italian wool and colors include black, grey or red. Libratone plans to offer additional covers in blue, pink, purple and yellow but it has not yet announced a price for them. Another fabulous Mono loudspeaker system for the in-crowd.